Before our bad day began last Wednesday, it actually started out with some pretty good news. I got a job. A part-time job, but a job in my field doing what I love doing. Since it’s part time, I will be working weekends and the job is in Grand Rapids, but it’s a job I’m really excited about and hope I can turn into full time. As a policy, I don’t blog about work and I’m not even going to give you hint as far as where it’s at, but expect to see a few more Grand Rapids and West Michigan reviews in the coming months. I actually start this coming Thursday and because of that, I had to cancel a visit my parents had planned for next weekend. After I called to cancel, my mom figured it could be a while before I have a free weekend either for them to come here or me to come home. She has to work Saturday night’s so she asked if they could just make a day trip on Sunday. J and I were both up for that, so they quickly changed plans to get up early Sunday morning and drive to Kalamazoo for the day. When they talked about coming next week, we had actually planned a trip to Fennville to pick strawberries and eat pie. Since they were going to be in the car for six hours, I didn’t want to make them drive an extra hour each way to get to Fennville. 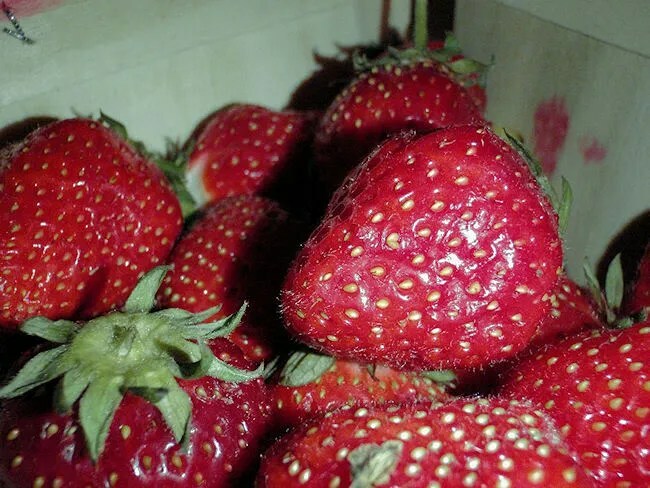 I couldn’t find a U-Pick strawberry place in Kalamazoo, but I did find a farm market that sells fresh picked ones. 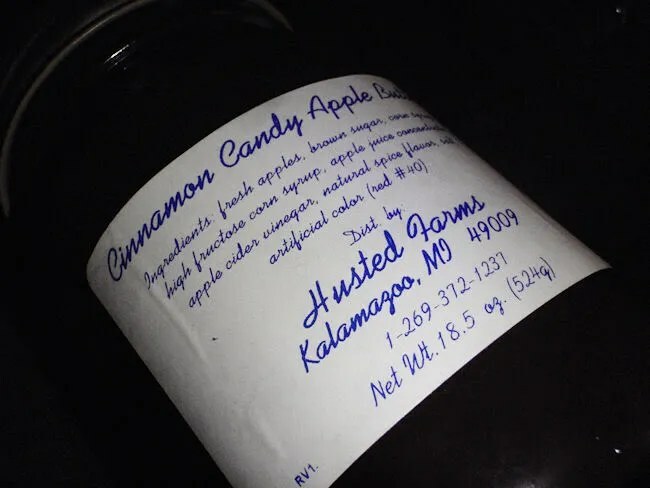 Husted’s Farm Market & Cider Mill is on Main Street west of Kalamazoo in Oshtemo Township. J and I actually passed it a few weeks ago on our way to South Haven and I think I said something like, “Oh, we need to keep that in mind.” I didn’t keep it in mind, but I did it while searching strawberry farms in the Kalamazoo area. When I told my parents where we were heading, they were expecting something more like Horrocks which they loved going to when we lived in Lansing. That’s not quite what we found. It’s not a big store. It’s a small, family run roadside stand. There is a small building that is filled with fresh fruit, home made salsa, home made cider, and some other unique hot sauces and bottled items. 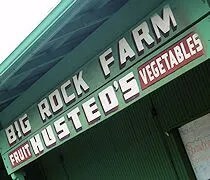 Outside, there is even more fresh fruit and veggies picked locally on the Husted’s farm as well as flats of flowers, herbs, and peppers. My mom and aunt went straight for melons while my dad, J, and I went inside. My dad took a long, hard look at the various hot sauces and salsa’s. My brother is on a spicy kick lately and he was going to bring some home, but he, not being a fan of spicy, didn’t really know what was too much or not enough heat. It took him a long time to decide. J picked up a pint of strawberries, a pint of cherries, and some home made Cinnamon Apple Butter before I could even turn around to see what she was doing. I picked up a lemon for her since I was standing right next to them and it’d save us a trip to Meijer. We paid for our stuff while my mom and aunt were still looking. I had enough cash on me and that’s a good thing. They don’t take credit, but they will take a check. Our bill was just a little over $13. I knew my mom was in the market for strawberries, but after I took our stuff to the car, I came back to find an employee walking out with a whole flat of strawberries. My mom had called my grandma and asked if she had any use for fresh strawberries. Well, my grandma apparently makes a delicious strawberry jelly. She doesn’t know it yet, but she’s going to be making A LOT of strawberry jelly. My mom also picked up a pint of sweet cherries and my aunt got a melon. Finally, my dad made a decision and went back and bought a container of the Twisted Texas salsa and we were ready to go. We went looking for fresh strawberries and we found fresh strawberries. My mom and aunt usually buy their strawberries at Walmart. 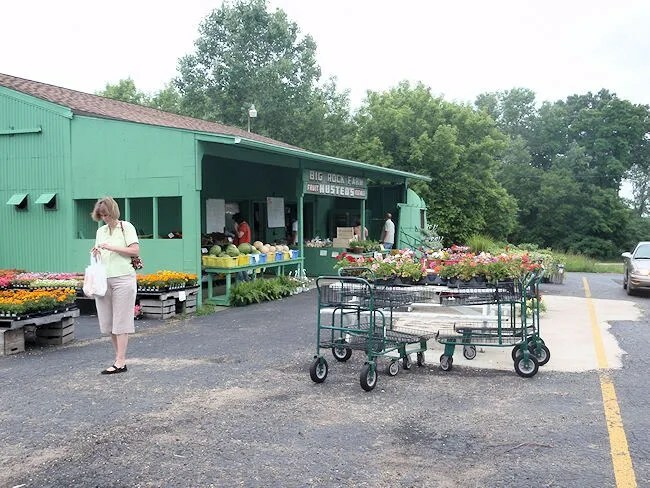 They don’t have the fresh produce stands or farmer’s markets where they live in Illinois. They were really surprised at how sweet the fresh berries, which probably just came out of the field, were. My mom likes to put a lot of sugar on her strawberries…these berries don’t require quite as much sugar. What they’re going to do with a whole flat of fresh strawberries, I have no idea. I know we did make a run to Meijer and got some melting chocolate to make a batch of chocolate covered strawberries while they were here. They also washed off quite a few and just snacked on them. Both my mom and aunt were impressed at just how juicy they are. My mom remarked that the insides were very red. The ones she’s used to eating usually have a lot of white in the middle. Not these. Whenever it is my parents can make another trip to see us in Kalamazoo, I know where we’ll be going. My mom and J were looking over the harvest schedule to see what comes in season when. J and I will probably be making multiple trips out to Husted’s this summer. She was impressed with the quality of produce and can’t wait for more Michigan grown products to come in to season. Freah, sweet, ripe Michigan Fruit comes straight from places like this!!! !